Acne – it is the most common skin problem faced by both men and women. The main culprits behind the problem are hormonal changes, stress, unhealthy eating habits and improper hygiene. All these factors lead to excess production of oil which clogs the pores. The clogged pores become breeding grounds for bacteria which lead to inflammation of the skin pores. How Green Tea Helps To Reduce Acne? Green tea inhibits the production of sebum by 50%. It is 50% more effective than benzoyl peroxide. It has anti – bacterial property which helps to kill the bacteria that cause acne. Green tea contains 6 active catechins which includes epicatechin gallate, epigallocatechin, epicatechin, gallocatechin, epigallocatenin – 3 gallate or EGCG that prevent cell damage, reduce irritation, inflammation and protect against the free radicals that cause acne. It helps regulate insulin levels, blood pressure and balances hormones, both of which contribute to the severity of acne. Green tea prevents acne scarring. Green tea contains anti – oxidants, ascorbic acid (vitamin C), tocopherols (vitamin E), carotenoids (vitamin A), selenium, zinc, manganese, and chromium, which are essential to healthy skin. It protects the skin from sun damage that enhances the appearance of acne scars. Consumption of green tea triggers the release of cortisol, which reduces stress and, by extension, stress-induced acne. How to use Green Tea as an Acne Treatment? Green tea can be used to treat acne in many ways. We have listed them below with a detailed description. For some people, green tea application may dry out the skin. So, it is recommended to apply a good moisturizer after trying out each treatment. One of the best ways to treat and prevent acne is to deal with the root problem. Drinking 4-6 cups of green tea a day regulates hormones and sebum production, inhibiting the formation of acne. You can add a tablespoon of honey into green tea for added benefits. Using a cotton ball, apply green tea to the skin (or) pour in spray bottle and spritz on. Allow it to dry completely and then rinse with water. Pat dry and repeat the process daily. Note: You can apply the used green tea bag (chilled) on the breakouts for 5 minutes. Raw honey moisturizes skin and kills the bacteria causing acne. When green tea is mixed with honey, it becomes an amazing solution which not treats acne but also provides refreshing look. Steep a green tea bag in boiling water for 3 minutes. Let the tea bag cool, then open it and take out the leaves. Add organic raw honey to make a paste. Wash your face with water and apply the paste on the acne affected skin. Note: You can use green tea powder instead of wet tea leaves. Lemon is a natural astringent. It kills the bacteria that cause acne and bleaches away scars. This combination can be used internally and topically. To 1/4 cup of green tea add juice of 1 lemon. Using a cotton ball, apply the mixture to skin. Leave it on for at least 10 minutes, but preferably overnight. Repeat the process daily to clear acne. For added benefits: Add 1 tablespoon of lemon juice to a cup of green tea and drink 2 times in a day. Being an astringent, apple cider vinegar dries out the pimples. It also cleans the pores by exfoliating the dead skin cells, oils and other impurities. Mix 2 tablespoons apple cider vinegar into a cup of green tea. Add raw honey as per taste, mix well and drink it. Rinse your mouth after drinking as apple cider vinegar can damage tooth enamel. Mix 1/4 cup of brewed green tea, 1/4 cup water, and 3 tablespoons of apple cider vinegar. Using a cotton ball, apply the solution to acne affected areas in the morning before applying a moisturizer and at night time to cleanse the face. It helps to refresh and rejuvenate the skin cells and prevents acne. Garlic is anti-bacterial, anti-fungal, and anti-septic. It strengthens the immune system to fight off the bacteria that cause acne. Brew some green tea, add mashed garlic and let it steep for 5 minutes. Consume the tea (with or without straining). Empty the contents of a green tea bag into a bowl and use a pestle to grind them into a powder. Combine green tea powder, 3 drops of tea tree oil and enough grapeseed oil to make a paste. Using fingertips, massage the paste on the acne affected areas, avoiding the area around the eyes. Leave it on for 15 – 20 minutes or until dry. You can replace grapeseed oil with jojoba oil or fresh aloe vera gel. The albumin present in egg white destroys the cell structure of bacteria and kill it. It shrinks the skin pores which prevents the accumulation of dirt. Brew green tea and let it cool down to room temperature. Combine green tea and 1 egg white. Wash your face thoroughly with water and pat the skin dry. Apply the mask by focusing more on the acne affected areas and leave it on until dry. Repeat the process 2 times weekly. Ginger has anti-bacterial, analgesic, and sedative properties that detoxify the skin and reduce inflammation. Pour into saucepan and bring it to boil. Add 1 teaspoon of peeled and minced ginger root. Remove from the heat, add 1 tablespoon of lemon juice. Sweeten it with raw honey if desired. Note: you can strain out the ginger chunks or chew them with the tea. Rinse a green tea bag with hot water. Cut the bag open and remove the leaves. Mix the leaves with 2 tablespoons of any face wash that contains acne fighting ingredients. Apply to the face and massage in gentle circular motions. Leave it on for 5-7 minutes. Repeat the process daily to get rid of acne. Rosewater helps to remove the accumulated dirt, dust, oil and other impurities from the skin pores. Heat rosewater in a pan. Place green tea bag in rosewater and let steep for 7 minutes. Once it cools down, pour rosewater in spray bottle. Store this in refrigerator and use this as a toner at night time before going to bed. Wash the face in the morning. Yogurt reduces inflammation and kills the bacteria causing acne. Let the bag cool, then open it and take out leaves. Gently rub wet leaves all over affected skin for 5 minutes. Apply full fat yogurt over tea leaves. Wipe with washcloth soaked in lukewarm water. You can pour the left over green tea in to a spray bottle and use it as toner. Mix 1 teaspoon of organic powdered green tea with enough water to make a paste. Using a soft-bristled brush, apply it to the affected areas of the skin. Leave it on for 10 – 15 minutes or until dry. Repeat the process regularly to get relief from acne. Brew green tea, let it cool down, pour into ice trays, and freeze. Alternatively, you can add powdered green tea or dried tea leaves into ice tray. Fill the ice tray the rest of the way with water. Place in freezer until cubes harden. Rub the green tea ice cubes on acne twice a day. Sugar contains glycolic acid, which exfoliates the skin to remove dead cells, stimulate proper blood flow and helps in skin renewal. Brew some green tea and allow it to cool down. Combine enough amounts of green tea, 3 tablespoons of sugar and 1 teaspoon of honey. Apply the mixture on the affected areas of the skin. Massage gently in circular motions. Leave it on for 4 minutes, then rinse with lukewarm water and pat dry. Apply the remaining green tea as toner. For added benefits: You can add honey (to moisturize) or lemon (to cleanse) or yogurt (to soothe). Green tea oil detoxifies skin, clears up blemishes, reduces the appearance of acne scars, restores the skin’s moisture balance, and stimulates skin regeneration to reduce signs of aging and keeps the skin looking young and healthy. It can be found at any grocery store, pharmacies or ordered online. Each night before going to bed, massage few drops of green tea oil gently onto the skin. Rinse with water in the morning. Can Green Tea Cause Acne? Just like any other acne treatment, green tea produces different results for different people. Some claim that green tea contains fluoride, which actually causes acne. Yet, others say that the fluoride is actually present in the water that is used to brew the green tea. So, always make sure to use organic green tea and pure, distilled or filtered water for the above acne treatments. Try any green tea method for few days and check if it is healing the acne or causing new breakouts. If it is causing the breakouts then avoid using it further. Always use organic green tea. Use acne creams and lotions that contain green tea. If you are using any OTC acne medications or ointments, discuss green tea treatments with your doctor before use. To avoid side effects like insomnia, irritability, dizziness, and loss of appetite, use decaffeinated green tea. Pregnant women should ask a doctor before starting green tea treatments. Loose leaf and powdered green tea contains more ECGC than other forms, so they are more effective. Don’t add milk to green tea as it diminishes the anti-oxidant properties that treat acne. Add a few teaspoons of green tea to your sunscreen when spending time outside. While brewing green tea, lean your face towards the steam to open pores, and then wash your face to remove impurities. If you can find it, use Matcha green tea for these acne treatments. Drink green tea at least 3 times in a day. Do not store green tea for a long period of time. Have you tried any of these green tea remedies or other home remedies for acne? Tell us which ones worked best for you! In Method 2. I’m I pouring out the contents of the tea bag or drawing it then using the green tea water? 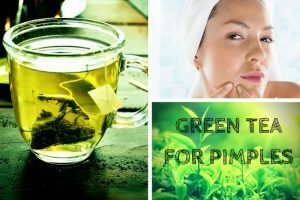 You have to use green tea water for applying or splashing on the acne affected areas. Yes. The 6 active catechins present in green tea prevent the cell damage and protect the skin from free radicals. The antibacterial property present in it fights off the bacteria causing acne. So try it regularly to treat acne. how long will it tak to reduce acne using green tea?? It is difficult to mention the exact time as everyone’s skin type and healing capacity is different. So, try the process regularly with some patience until you achieve the results. I have brown marks on my face please advise what i can drink to clear aprt from water. What if the green tea bag is caffeine free does that affect anything? Or does change anything? Even if the green tea bag you are using doesn’t contain caffeine, it can also helpful in treating acne because it contains anti-oxidants and other beneficial properties. So, you can try it to reduce the appearance of the acne lesions. can i use green tea as a toner and how long can i use them (the toner). for 1 week / month? Yes, you can use green tea as a toner. You can prepare and store the green tea toner for 1 – 2 weeks. You can apply it daily after washing your face. Where should I store the Green tea toner? Does it need to be refrigerated? Yes, you need to refrigerate it. Can green tea helps to reduce hyperpigmentation caused due to acne scars? , n can u tell me the process?